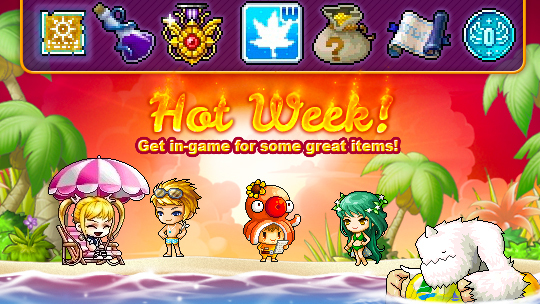 To celebrate the launching of Override update, MapleStory decided to hold a Hot Week event which starts on June 26th and ends on July 2nd. For players who own a character with Level 33 at least, they will receive a Gift Box everyday. As long as you have enough claimed gifts, you will be able to see the Hot Week reward. So, clear your unclaimed gifts and be sure there are not 15 unclaimed gifts in the gift box. Each day's Gift Box will be removed from 2:00 AM PDT. • 2x EXP Coupon (x3): Untradeable, 7-day duration. Use to receive 2x EXP for 30 minutes. • Bonus Potential Scroll 60%: Untradeable, 7-day duration. According to the official notes, once you get every Gift Box from Monday to Saturday, then on Sunday you can select another gift from all of the items that were given out from Monday to Saturday.